Today I stopped by my neighborhood drug store on the way home from work. I noticed the store has recently been reconfigured to accept self check out. This new technology has had two benefits that I can see: 1) the lines move much faster and 2) it overtly asked you "how many bags you are taking" and then charges you 5 cents per bag. By the check out counter there are only plastic bags to choose from, so it's the plastic bag or nothing. 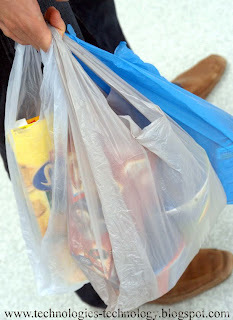 DC has recently passed a "bag tax" of 5 cents per paper or plastic bag starting the first of the year. What was really interesting about this experience for me was the fact that I was buying a bunch of bulky items today and I really was considering picking up a bag to carry them a few blocks home. But in a split second... literally the moment after I realized that picking up a bag would cost me something... I decided to make due with stuffing the items in the bag I had with me. It's like I was watching myself in a social behavior experiment... will she take the bag if it costs her something? Or will the small cost of 5 cents not even enter her conscience? Honestly, I changed my mind to go sans bag, and probably would have again, even if the bag cost just a penny. This little experience today has reinforced my belief in the importance of incentives and disincentives to drive behavior to be more environmentally friendly. Let's take this same analogy to the workplace. What if companies had to pay more hefty fines for garbage pickup? What if individuals had to pay for Styrofoam cups at the coffee bar? Would we make the same decisions if we always had to pay for the negative externalities of our choices? When San Jose, California introduced a user pay program in which residents were charged based upon the size of the container they placed at the curb, the impact was a 46% decrease in waste sent to the landfill, a 158% increase in recyclables captured, and a 38% increase in yard waste collected. There was no charge for curbside recycling and yard waste was collected at the curbside. Worchester, Massachusets introduced a program in which residents purchased bags for their garbage. This program resulted in a 45% reduction in the waste stream, with recycling responsible for 37% of the waste stream diversion. Residents were not charged for recycling nor for dropping off yard waste at a collection center. Actually, we've had something similar here (Sherbrooke, Qc, Canada) for at least 3 or 4 months and well I think it's a great way for consumers to buy reusable bags...anyway it helped me. Yes, I know 5 cents is not really expansive, but over the course of the year, it can end up expansive. While a reusable bag is like 3$, you can use it over and over and it stocks probably 3 plastic bags worth of groceries. So not only will consumers save some $$, but they will do a bit more for their environment.